Is it silly for holding so dear this little icon of recognition? I’m officially a NaNoWriMo: 2012 Winner! Of course not, no sillier than the little stars we stuck on our tally cards. Those small shiny rewards were surprisingly motivating. 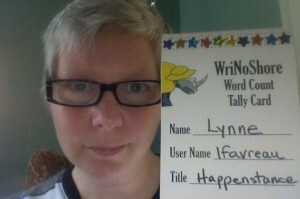 Here I am with my WriNoShore Tally Card. See the shiny stars? There are five days left, still plenty of time to get those word counts in. Just keep writing!